Today a real estate broker contacted me. After decades of hard work they re-branded their company. This included a new URL. You would think that someone would set up a proper 301 redirect for her and be done with it. Nope. 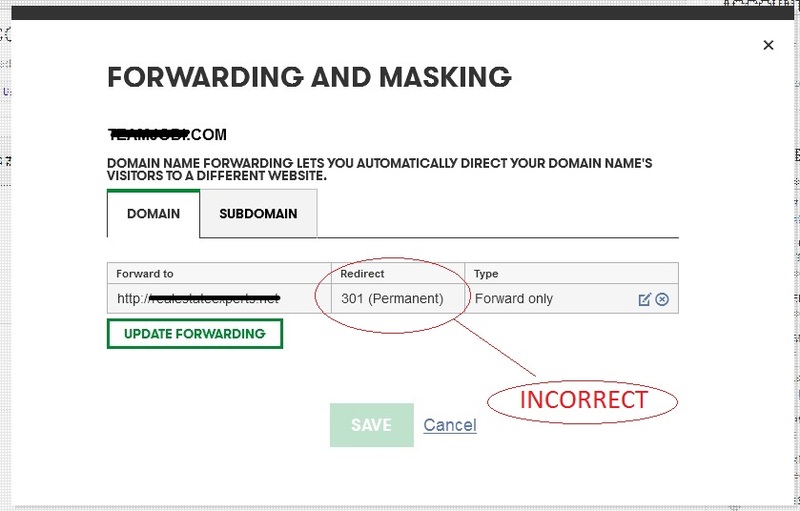 Does GoDaddy Domain Forwarding result in a proper 301 Redirect? I don’t care who tells you otherwise, it could be Mr. Daddy himself, the Domain Forwarding feature does NOT properly 301 redirect a site. Using this feature will result in devastating effects to your SEO efforts. Scroll down to the bottom of this article to see what really happens when you use GoDaddy Domain Forwarding. What is the difference between a 301 Redirect and a 302 Redirect? A 301 Redirect tells search engines that the pages have been permanently moved. When search engines see this, assuming your content structure has remained the same, all of the links you had on the old URL will follow through to the new URL. Below is what it will look like in Google Search Console (formerly known as Webmaster Tools)- it will show the links to your URLs “via this intermediate link”. A 302 tells search engines that the old URL should be maintained because it will be back soon. Thus, search engines do not crawl the new pages, and when they do, they will rank poorly. Most importantly, links pointing at your old content will not transfer any link juice over the new domain, resulting in a massive drop in search visibility and also traffic. You are all done. Just make sure that the old domain remains hosted somewhere. That .htaccess file needs to remain live. I’d go ahead and leave it up for a few years. If you’re still not sure if your 301 is in place correctly or not you can check the HTTP headers using a tool like this HTTP header check. Unfortunately there are people out there that believe you have to 301 redirect each individual file of a website. This is absurd and I’m not even going to address it further than I just did. If someone tells you this, reach through the phone and slap them. Twice. If you’re still stuck you may want to hire someone who knows what they’re doing. Feel free to visit my SEO page. Thanks for taking the time to post this. I just redirected a domain name with Godaddy Domain Forwarding a few hours ago and I couldn’t figure out why it was returning both a 301 & a 302. I even spoke to their customer support and they assured me that everything was ok. I was considering using htaccess instead. After your post confirmed it, I switched to an htacess redirect and it’s working like it’s supposed to. This was fantastic. Had no idea until we did the HTTP header check and thought all of the domains we had pointing at our site via GoDaddy were 301’ed, but they were 302’ed like you said. We did not have the domains hosted, just forwarded. Changed the NS to another host, and did our 301’s from there and after checking them via the HTTP check, did not need to do anything with the .htaccess file. thanks for taking the time to write this post. Awesome work! Could you provide more details on why you believe GoDaddy doesn’t properly 301 Redirect a site? I tested some of my forwarded domains using Godaddy and the permanent 301 redirect, using ScreamingFrog. It shows the original domain name as a permanent 301. Test a redirected URL using this header checker: http://www.webconfs.com/http-header-check.php. Len, thank you SO much for this article! I was just on the phone with GoDaddy support discussing this very issue. I called to ask about the difference between using their Domain Forwarding tool or setting up Redirect in their Cpanel. They rep originally told me that “they did the same thing”, but then after asking them 5 different way they finally said, that they “just use the term 301 to clear up confusion”, but that it “doesn’t really setup a 301”. Of course I pointed out that the policy literally causes confusion, rather than clears it up! I have a client that had a number of domains with duplicate info all trying to rank for the same brand. Seems a previous SEO “guru” told them this was a good idea. Anyways, I just finished the design of a new site and want to redirect all the old domains to the revamped one, and using your steps will work just fine for most of them. My question is, I still want to use the email settings on one of the old domains. If I make htaaccess changes on that domain, will it impact any other mx records or email settings? I want email@olddomain.com to work even though it now redirects to newdomain.com. You can keep using email of the domain that is 301 redirected.